This was the topic of one of the discussions that took place in small groups sessions during the Labtolab event in Nantes last June. What is a residency? A difficult question to answer, as residencies can unfold into some many formats, from 'ideas in residence', to sprints and micro-residencies, from ad hoc residencies to more formal long-term production residencies etc. What a residency is should then perhaps just be continuously re-invented. In the imagination of what a residency can be, comes in the idea of 'residency beyond artists', with opportunities for curators, researchers, staff etc., to also become 'residents'. One approach used to open up the discussion at LabtoLab was to look at the different phases of the lifetime of a residency. A residency starts way before the actual 'resident's' arrival, during what could be called 'a research phase', involving discussion with the future resident and potential collaborators. The importance of managing everyone's expectations was highlighted as well as the challenge of defining the frame (scope, resources, goals and a set of adjustable variables) for the upcoming residency. 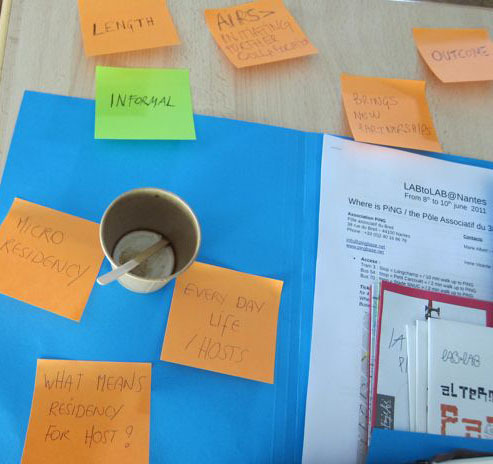 During the residency, crucial aspects are the relation to the local context and to the everyday life of the host organisation - because a residency is offering a context that is more than 'here is some time and space to work'. The residency has its own everyday life involving human and informal dimensions that are essential but often difficult to identify and document. Other questions posed in relation to the aftermath of the residency were: how to foster relations that were build between host & residents, between project partners? How to continue the exchange of knowledge? How shall the results of a residency be shared and disseminated? When does the residency end? Another important angle to consider when thinking of residencies is the added value of the residency for both the resident and the host. There are some obvious things that residents can get out of residencies: precious time and resources to work on a specific project, a context, exposure, networking possibilities etc. But it's also interesting to look at what are the benefits for the host. If we take the case of Pixelache, production residencies have provided cultural capital, international credibility, media coverage, opportunities to work with and learn from other organisations, new opportunities for collaborations and the list could be extended. Ideally residencies turn into such an exchange that they participate in the shaping of what the host organisation actually is. At best, residencies can be made into a space where multifaceted processes and interactions can happen, a free zone where art, dynamics, practices, organisations and relations are constantly re-imagined.